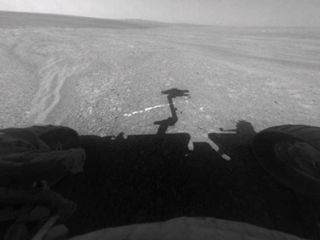 This view from the front hazard-avoidance camera on NASA's Mars Exploration Rover Opportunity shows the rover's arm's shadow falling near a bright mineral vein informally named "Homestake." SAN FRANCISCO — A well-traveled NASA Mars rover has found some of the best evidence yet that water flowed on the Red Planet's surface long ago, researchers announced today (Dec. 7). The Opportunity rover, which landed on Mars nearly eight years ago, has discovered a thin, bright mineral vein along the rim of a huge crater called Endeavour. This mineral is almost certainly gypsum that was deposited by liquid water billions of years ago, researchers said. "This is the single most powerful piece of evidence for liquid water at Mars that has been discovered by the Opportunity rover," Steve Squyres of Cornell University, Opportunity's principal investigator, told reporters here today during the 2011 winter meeting of the American Geophysical Union. The two rovers' prime missions were slated to last just three months, but both far outlived their warranties. NASA declared Spirit dead just this year, and Opportunity is still going strong. After a three-year trek, Opportunity reached the 14-mile-wide (22-kilometer) Endeavour Crater this past August. While poking around Endeavour's rim recently, it found the mineral vein, which is about 20 inches (51 centimeters) long and about the width of a human thumb. After analyzing the vein with Opportunity's cameras and X-ray spectrometer last month, researchers concluded that it is gypsum, a hydrated calcium sulfate that on Earth is used to make drywall and plaster of Paris. The vein likely formed right where Opportunity found it, researchers said. "There was a fracture in the rock, water flowed through it, gypsum was precipitated from the water. End of story," Squyres said. "There's no ambiguity about this, and this is what makes it so cool." Both Spirit and Opportunity have found other good evidence of water activity on ancient Mars, including signs of hydrothermal systems. But the new discovery at Endeavour Crater is particularly convincing and compelling, researchers said. "Here, both the chemistry, mineralogy, and the morphology just scream water," Squyres said. "This is more solid than anything else that we've seen in the whole mission." The gypsum vein is also intriguing for scientists interested in whether or not Mars was ever capable of supporting life. Some of the ancient wet environments Spirit and Opportunity have found were likely very acidic. But gypsum formation is consistent with (though not dependent on) a more neutral and therefore benign pH, researchers said. There's no water at Endeavour today, however. It's bone-dry, like the rest of Mars appears to be. Opportunity is showing a few signs of its advanced age, such as an arthritic shoulder joint in its robotic arm. But the robot just keeps chugging along, and should continue to do so into the future. "She's in excellent health," said Bruce Banerdt, rover project scientist at NASA's Jet Propulsion Laboratory in Pasadena, Calif. "This is far from being a rickety old rover." Opportunity should keep roving until next month, when it will position itself in a favorable spot to wait out the frigid Martian winter. The robot won't shut down during this time, researchers said; it will remain awake, studying the rocks around it and perhaps even moving a few feet now and then. If all goes well, the rover should put its traveling shoes back on next summer sometime, Banerdt told SPACE.com. The team isn't sure how far Opportunity can go or how long it will last on Mars, but they're happy they can still go along for the ride. "Every day is like a gift," Squyres told SPACE.com.